Having more than two parents is complicated. Children of divorce around the world know what that’s like. But James was raised in a different situation: yes, he had more than two parents, but in his case, it was all within the same family, at the same time. James was born into and raised in a polygamous family: his father was married to multiple women, which in James’ home country of Uganda, where the practice is legal, is not necessarily an altogether uncommon thing. It is, however, strikingly unpopular in many circles. Despite this, as recently as 2011, polygamous relationships in the country accounted for 25% of marriages, though with more frequent occurrences existing in rural settings. Uganda is one of only a handful of predominantly Christian countries – with others including the Republic of Congo, Zambia, and the Central African Republic – in which polygamous relationships are recognised by the law. For many Ugandan citizens, though, this is unacceptable. In fact, advocacy groups and women’s rights movements throughout the country have worked since as early as 1987 to outlaw polygamy, on the basis that in its current state it denies women the rights to equality in marriage. The most recent petition was discarded just last month in September 2018. James was raised before some of the most intense of these movements took shape in the Wakiso District of Uganda’s capital of Kampala, where he faced discrimination and bullying because of his personal family dynamics. Often ostracised in school from social groups comprised of children who came from families that practiced a more formal version of their Christian faith, which did not support polygamy as an accepted form of marriage, he was used to being an outsider. This feeling, however, led him to embrace a passion for building peace, especially in environments where that might not be the easiest task to undertake. After graduating secondary school, James attended Makerere University, not too far from his family’s home, where he earned both a Bachelor’s and Master’s Degree in International Relations and Diplomatic Studies, with an emphasis on Peace and Security. His passion for peace took him even further, though, inspiring him to pursue various peace-centric postgraduate certificates from universities across African and beyond. All of this was in an effort to become an academic and a peace advocate who could not only learn about and build peace, but also pass it on. It is no surprise, with his childhood having inspired his passion for peace, that James found Generations For Peace in 2015 and began volunteering with them, working with youth who, like him, may feel ostracised or victimised because of their background or identity. He remembered his own childhood and thought about his own two children, Patrice and Josephine, and even about his wife, Florence, and was driven to work to create a better future for them all. Florence has been by James’ side since their marriage in 2001. Their daughter, Patrice, has just recently entered into high school, while Josephine is studying to be a midwife at Mengo Medical School in Kampala. 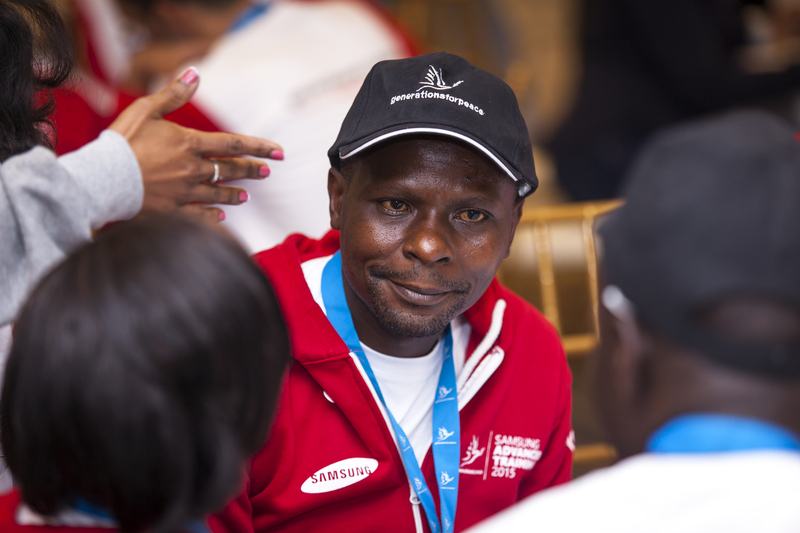 His work with Generations For Peace has allowed James to work alongside youth facing a wide range of challenges, from bullying to ethnic and religious division and conflict, and most recently to Gender-Based Violence (GBV). The new programme is incredibly important to James, who, having a wife and two daughters, was all-too familiar with the challenges facing Ugandan students. Uganda has long faced challenges surrounding GBV, especially in schools, and particularly for young girls with disabilities or other often discrimination-inviting characteristics. According to some studies, rates of GBV are a shocking two times as likely for such young girls, which is devastating for many reasons, not least of which is that other young girls experience it at estimated rates of 12%. Other statistics suggest even more staggering numbers, including that 40% of Ugandan students experience sexual abuse and gender-based violence either in or on their way to or from school and 43% of students in the country experience bullying and corporal punishment in the classroom. James is responding to this as part of the programme implementation team with Generations For Peace, Rights of Young Foundation (RYF), and the U.S. Embassy in Uganda. The programme works in two schools in Wakiso and Soroti, with James working in the former at Bussi Seed Secondary School. 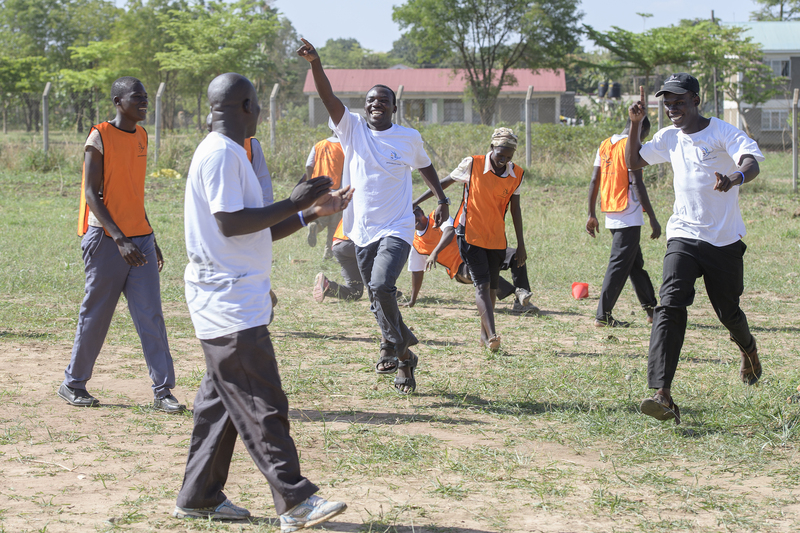 Using Sport and Arts For Peace, he and the other youth-leader and teacher Volunteers are working to address GBV, transform violent conflict both on campus and in the surrounding community, and reduce violence through increasing active tolerance and building peace. “I have learned what I already expected to be true: many of the Participants, especially the girls, have been victims of this abuse. Many had dropped out of school because of the social-psychological impact of these abuses. Others were maintaining serious emotional damage,” James said. Today, Uganda celebrates its 56th birthday. Generations For Peace and James are honouring this milestone by continuing to transform conflict and build peace across the country.